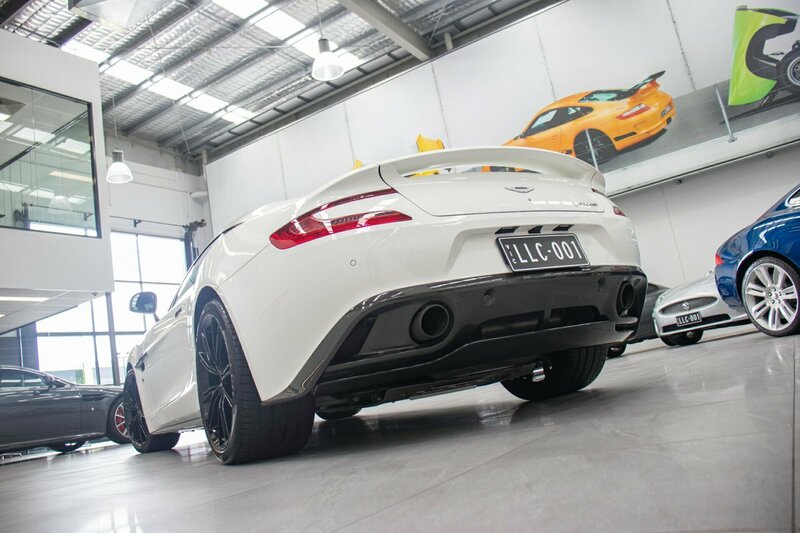 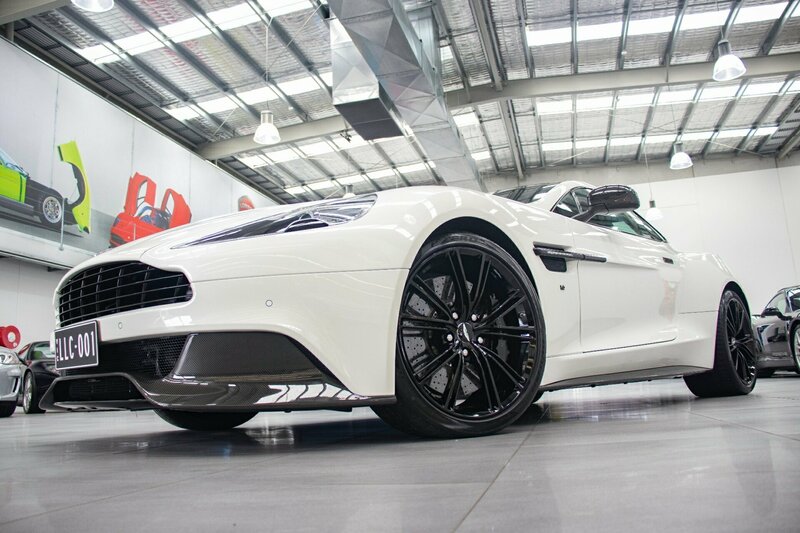 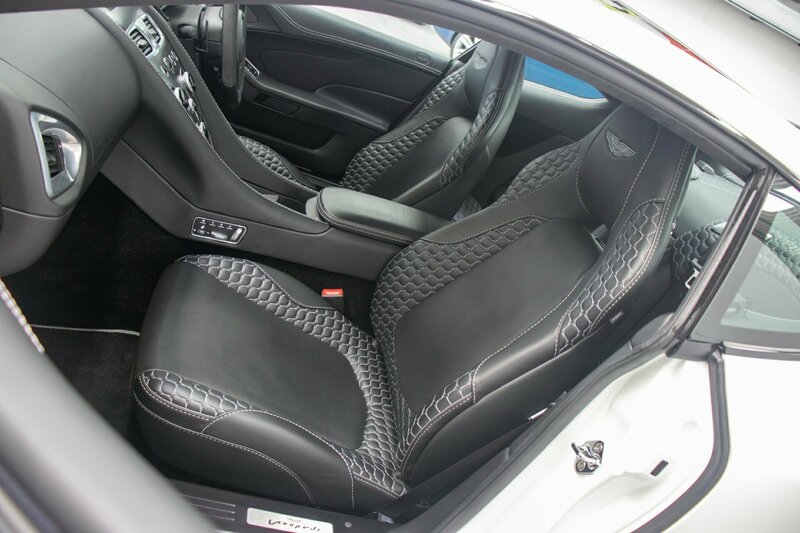 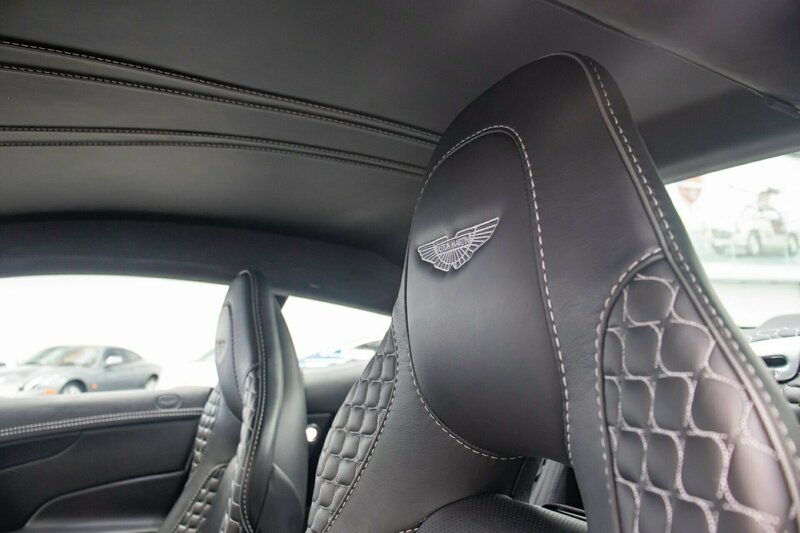 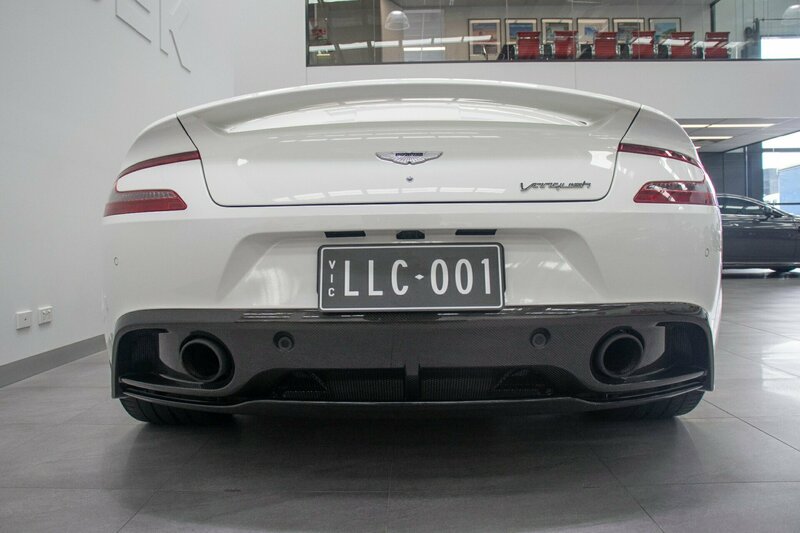 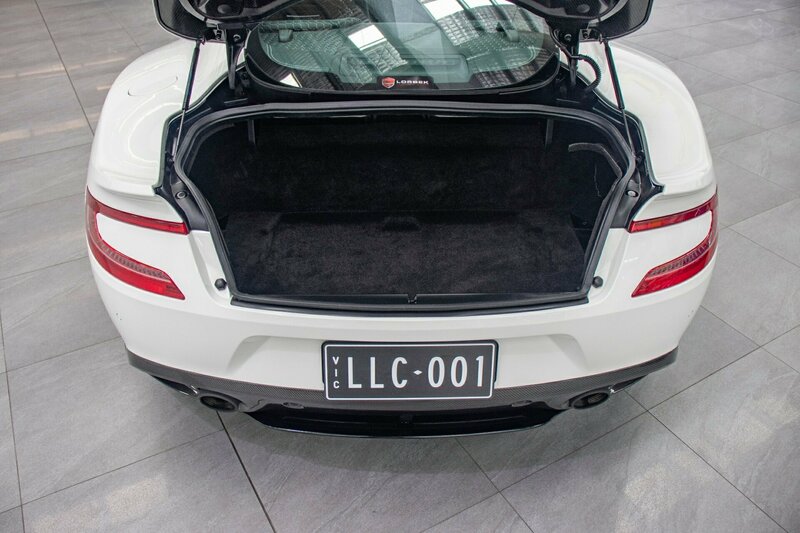 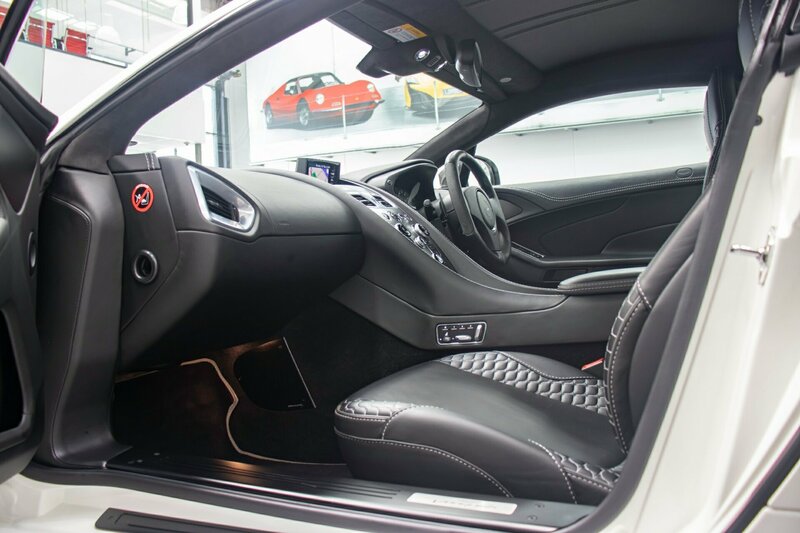 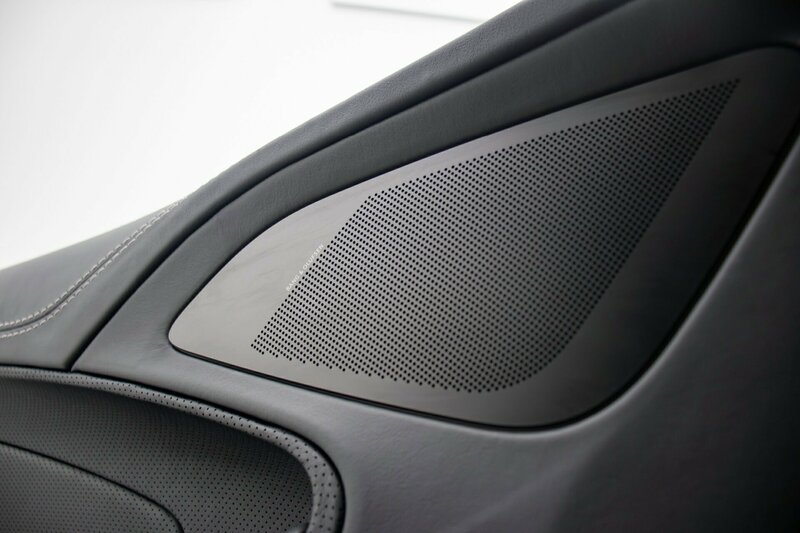 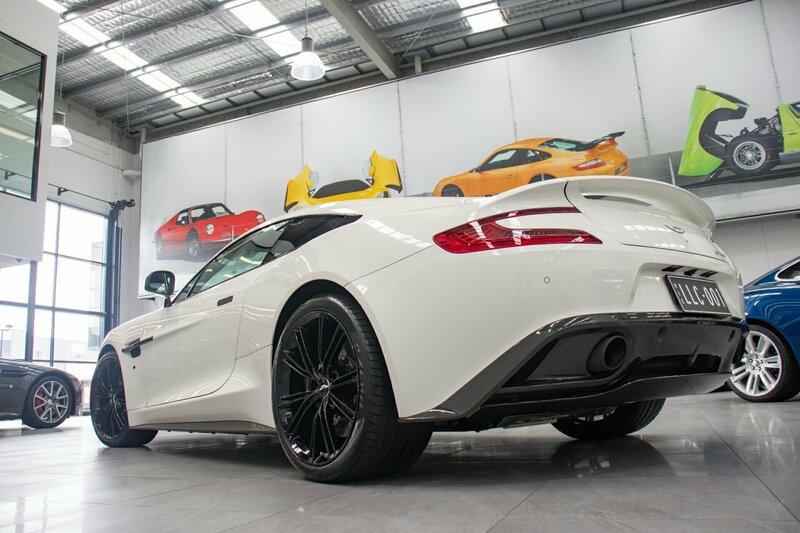 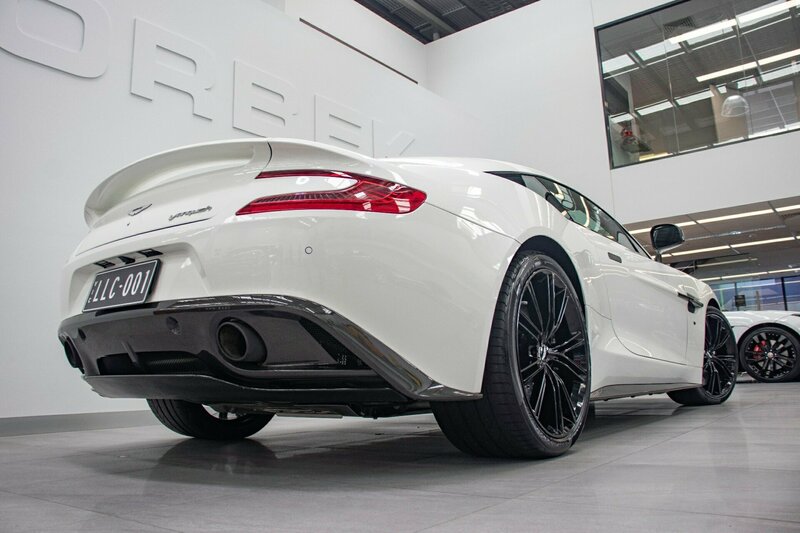 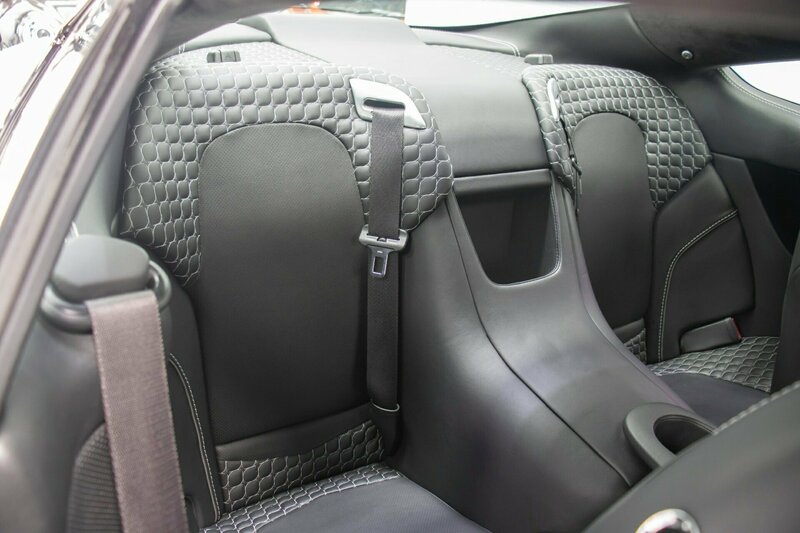 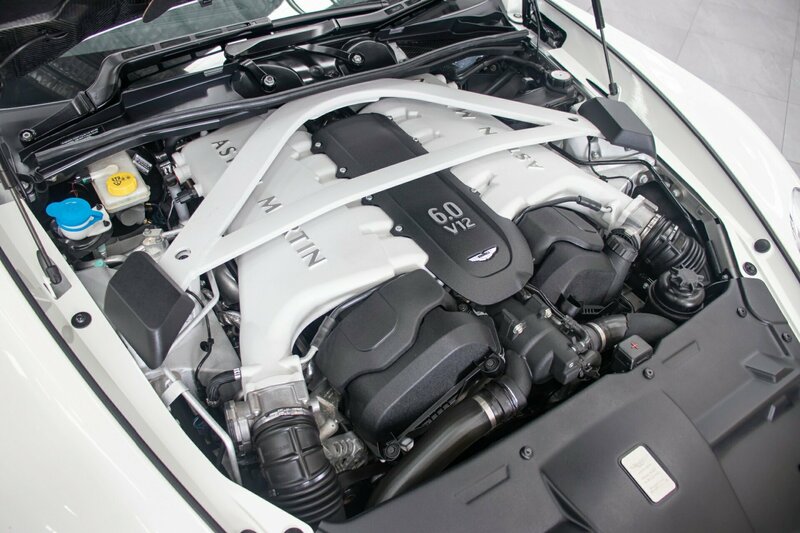 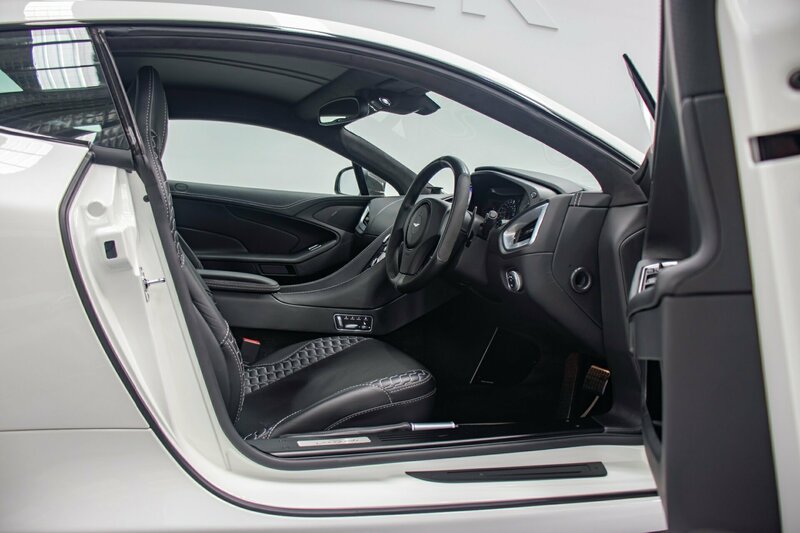 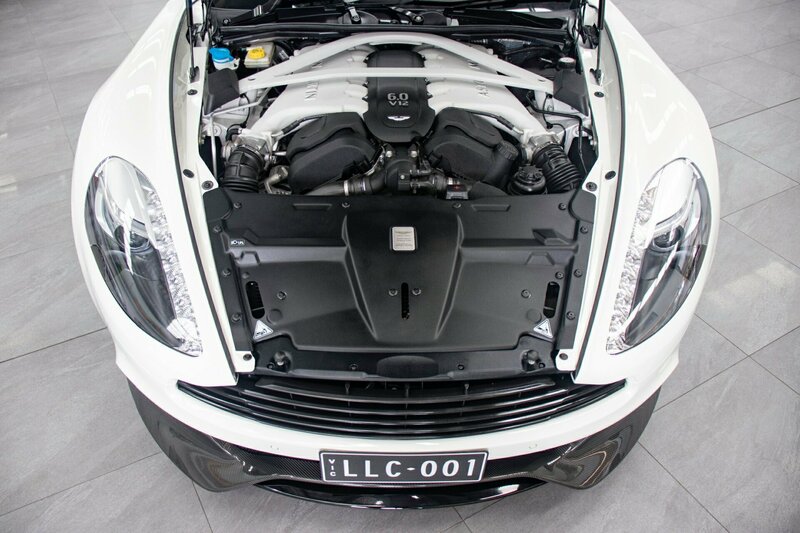 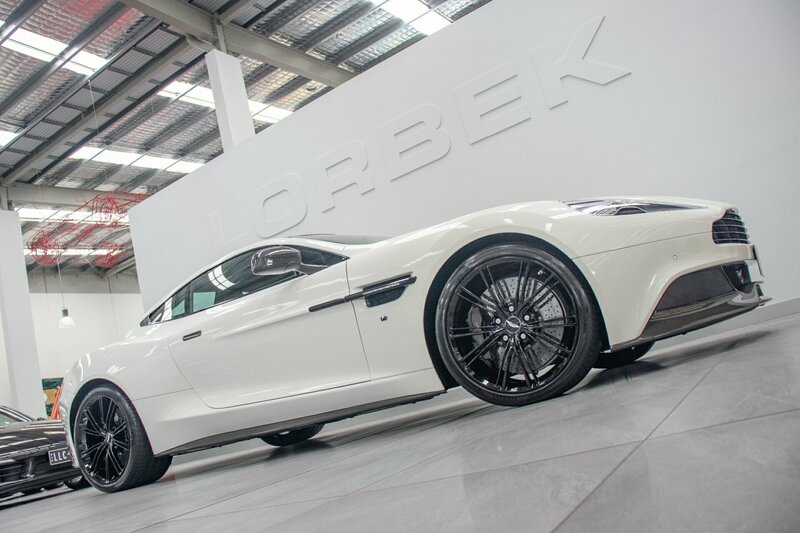 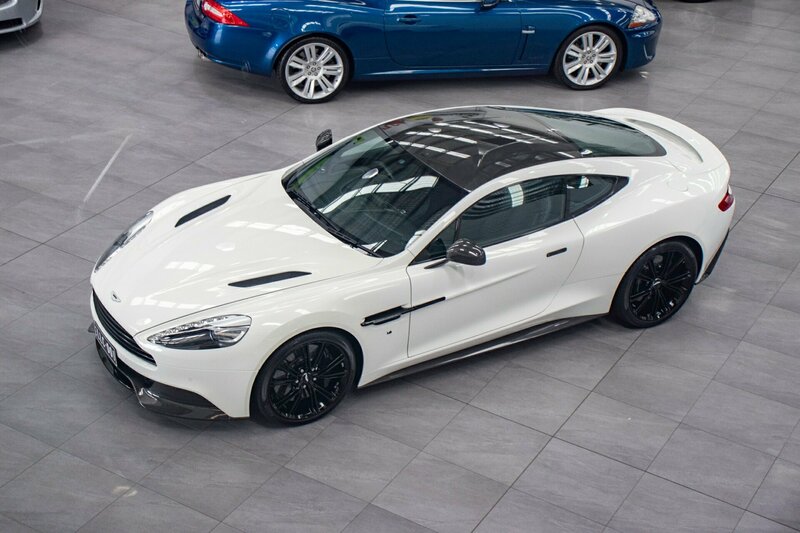 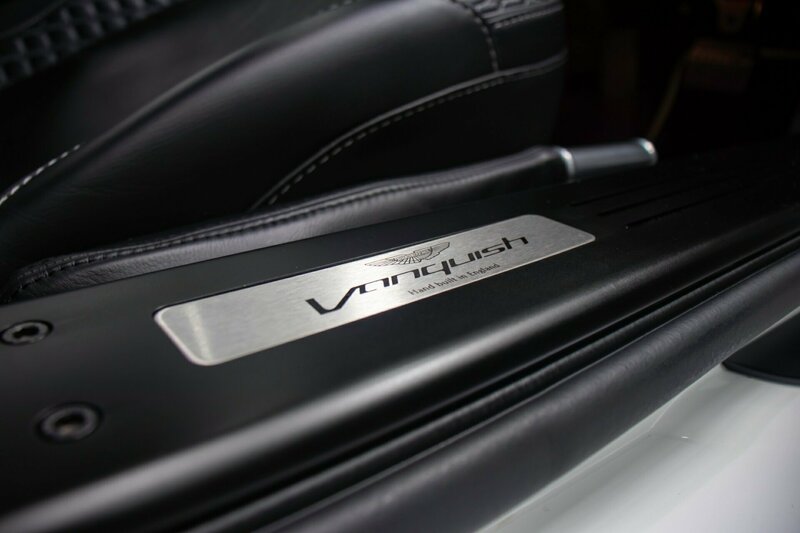 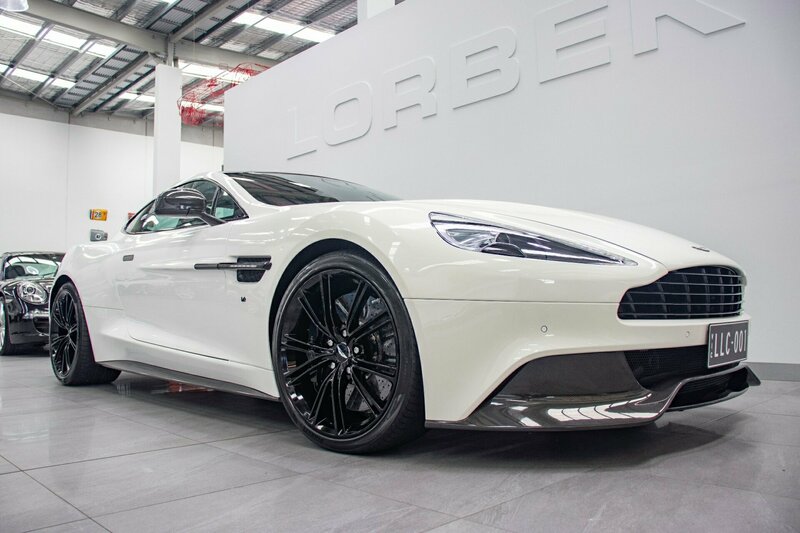 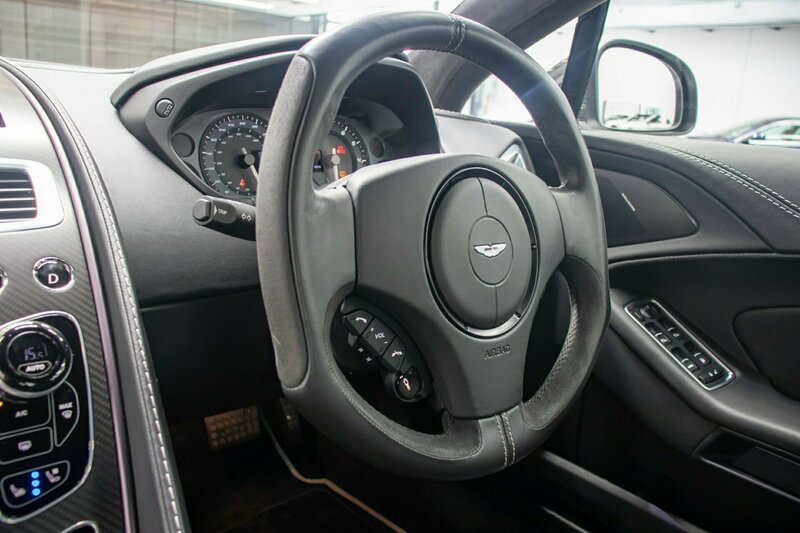 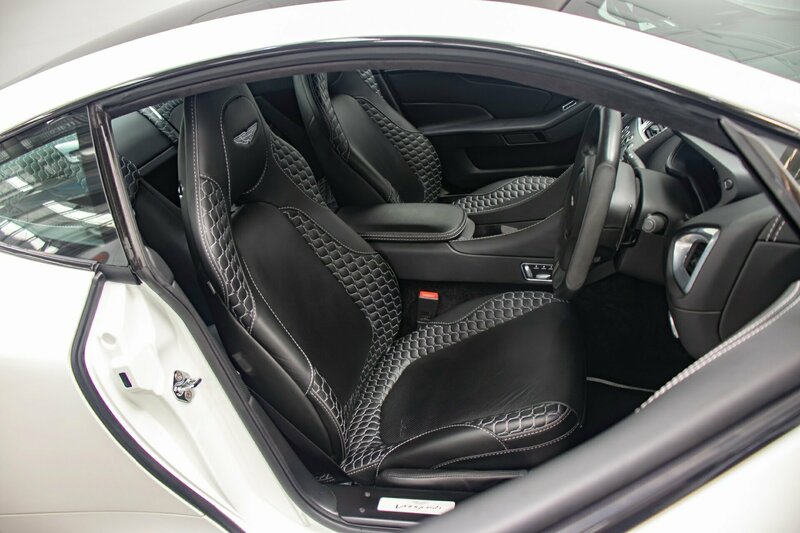 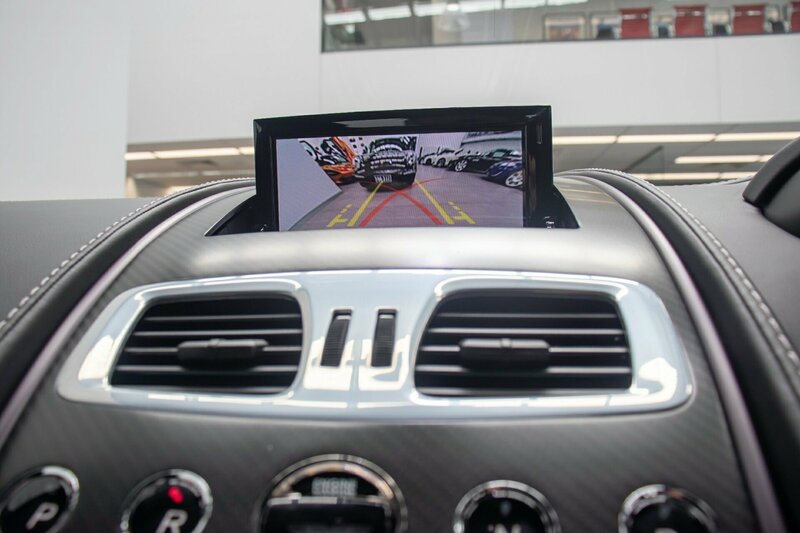 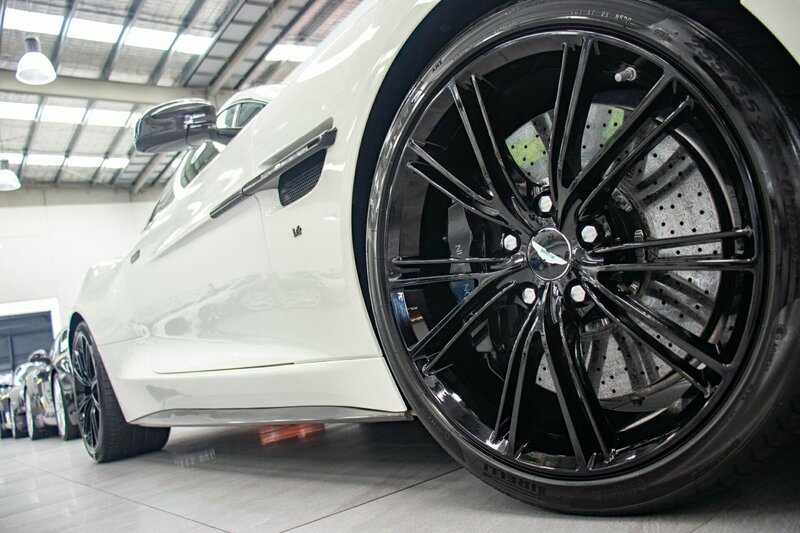 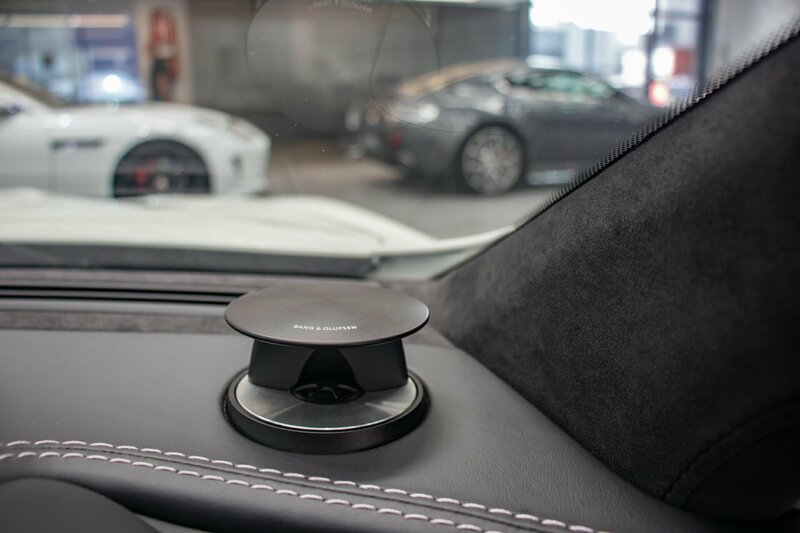 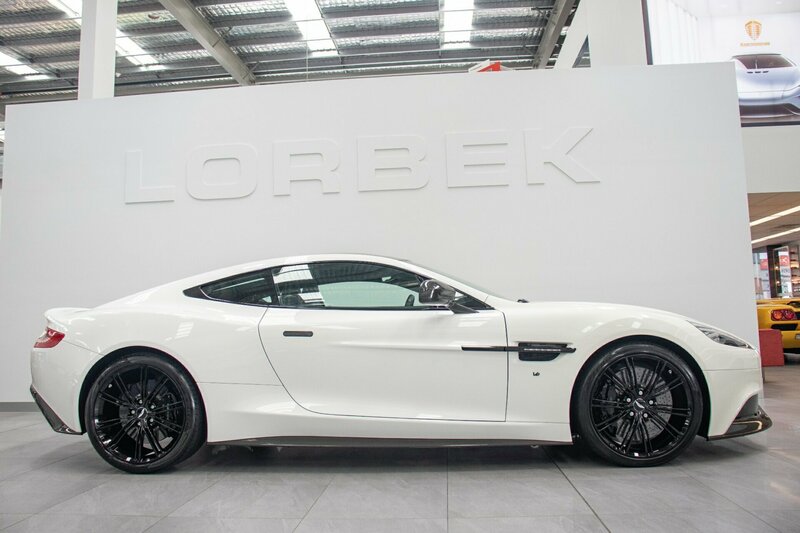 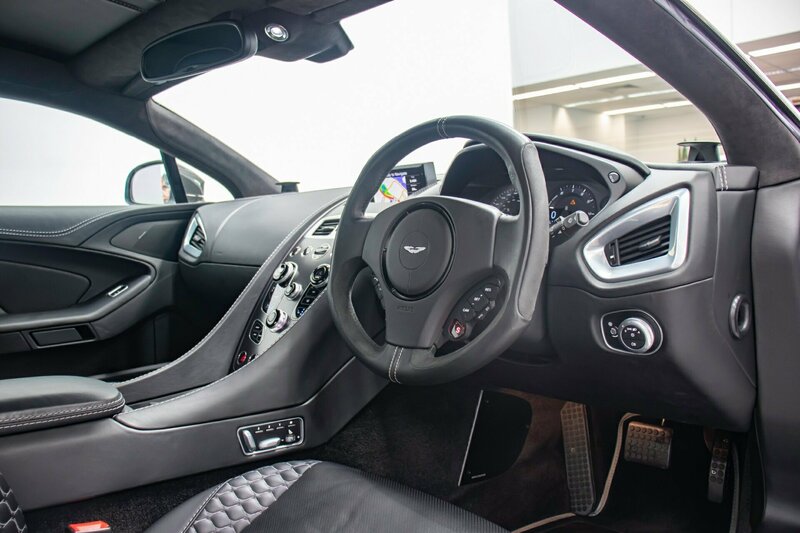 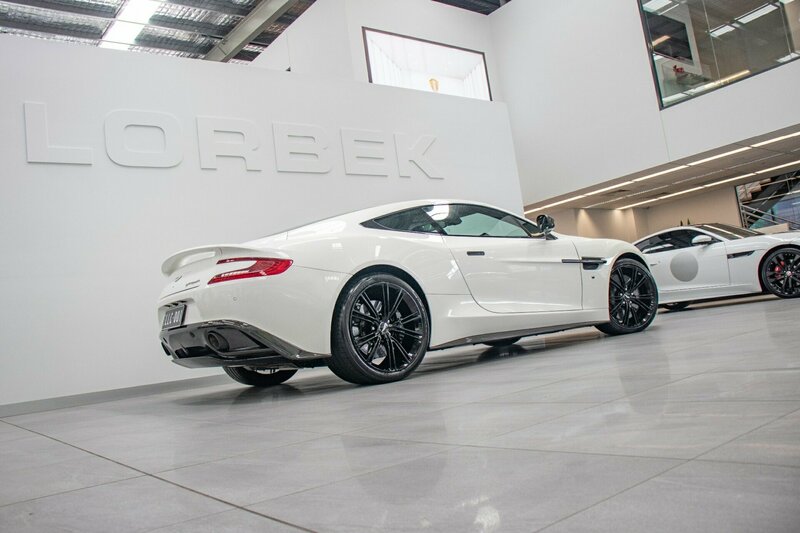 ASTON MARTIN VANQUISH (2+2) 6.0L V12 2014.5 TRAVELLED ONLY 27,740KMS FROM NEW AND STILL AS BRAND NEW CAR CONDITION WITH FULL CARBON FIBRE PACKAGE AND FULL BLACK PACKAGE. 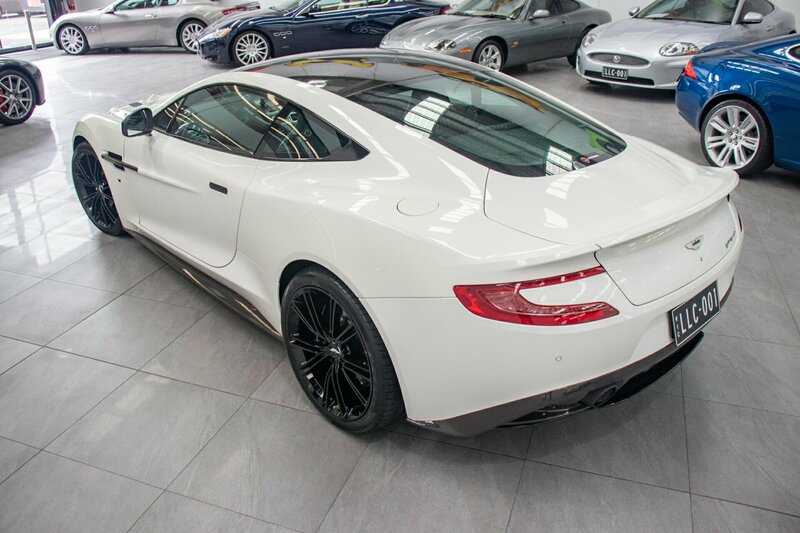 Finished in the most stunning striking colour combination of Pearlescent Stratus White with soft touch luxurious Obsidian Black Caithness leather interior throughout with quilted honeycomb stitched seats, Obsidian Black leather matching dash and door inserts with silver stitching throughout, complete Satin Chrome Jewellery interior Pack and full grand piano black console with full length Twill Carbon facia trim and trim inlay. 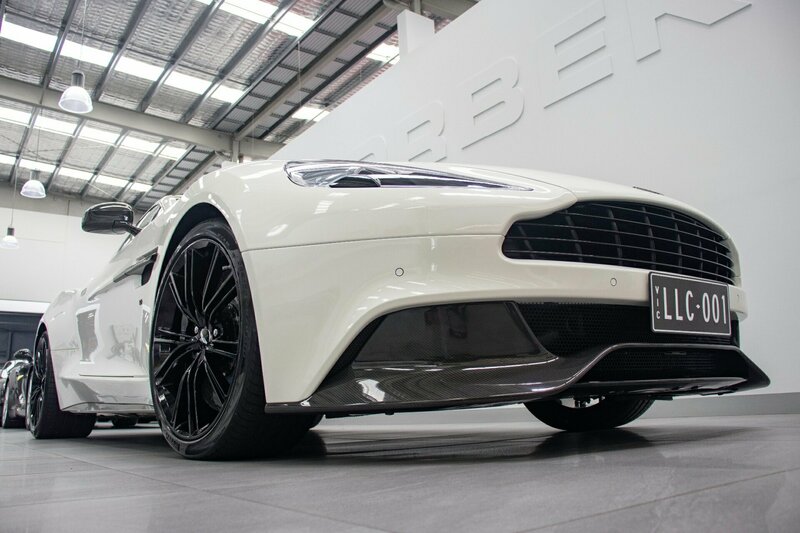 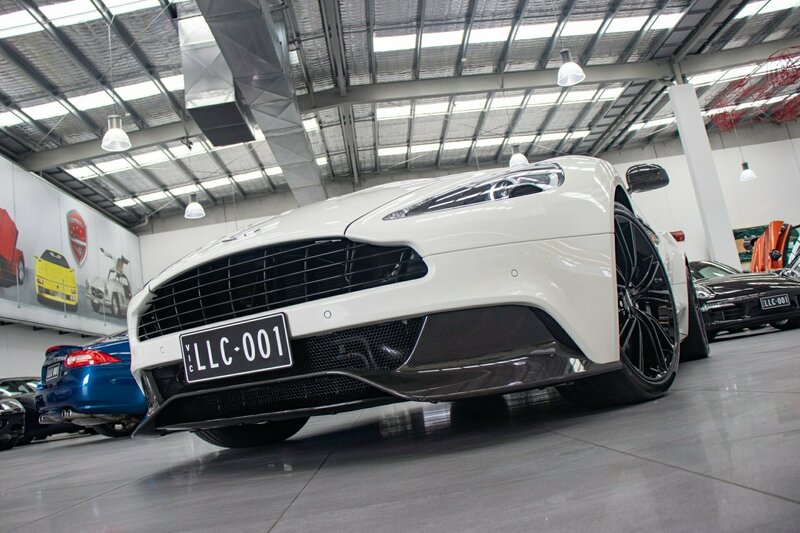 Full factory CARBON FIBRE exterior body pack including mirror cap, roof panel, rear diffuser, side skirts and front CARBON FIBRE front lip. 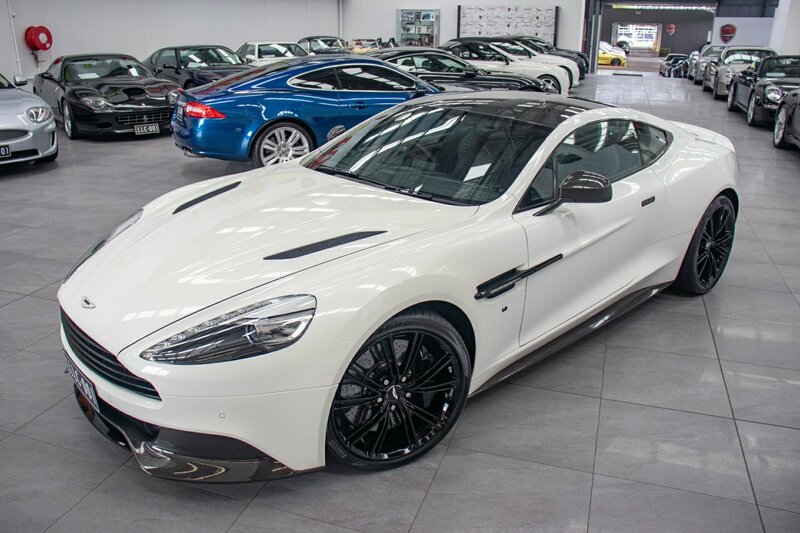 Fully optioned with every factory luxurious option, full electrics, factory power ventilated HEATED and COOLED lumbar support SPORT SEATS with Aston Martin Wing silver embroidery stitch, warm charcoal seat belts, multi-function on board monitor with GPS navigation, all multi-function features, multi-function Alcantara and One77 leather steering wheel with black paddle shifts to match upper trim, cruise control, factory phone/Bluetooth function, premium Bang and Olufsen surround sound Hi-Fi sound system, iPod, MP3 compatibility, tinted windows, xenon lights, REVERSE CAMERA and PANORAMIC PARK DISTANCE control, black textured tailpipe finish, factory premium quality 20 inch 20 Spoke Satin Black wheels with black CARBON CERAMIC brakes. 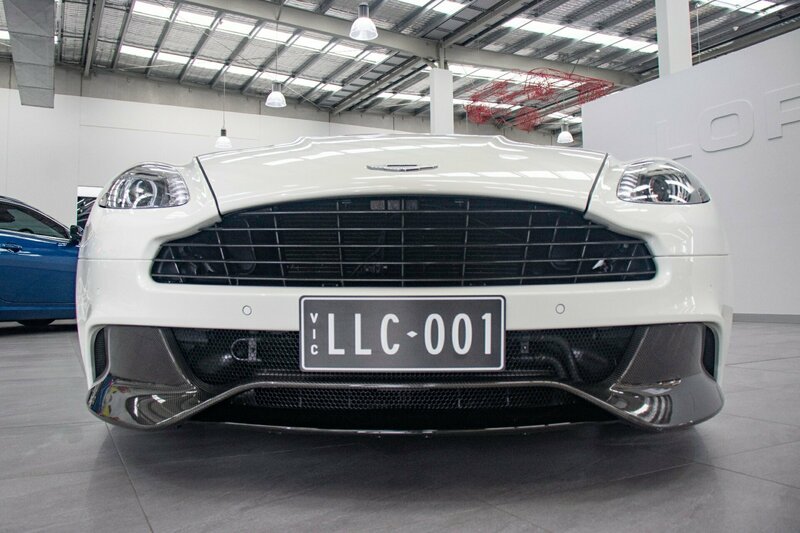 Full factory accessories pack and many extras. 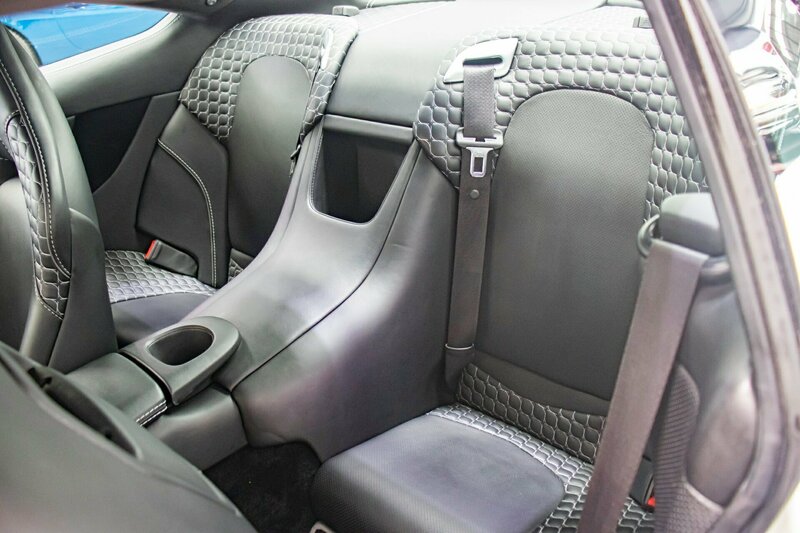 Options list available on request. 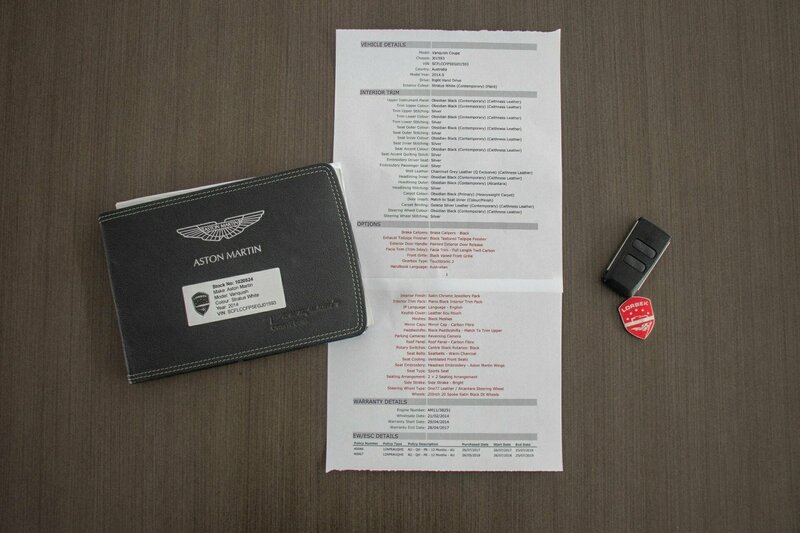 Complete Aston Martin handbooks/new car books, FULLY DOCUMENTED ASTON MARTIN SERVICE HISTORY FROM NEW and both original issued new car keys. 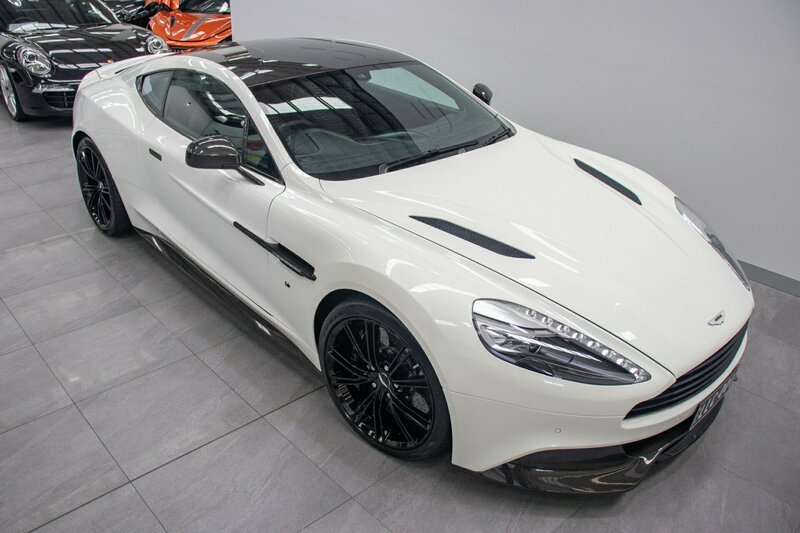 This very special super exotic 2014.5 VANQUISH WITH FULL CARBON FIBRE PACK is virtually indistinguishable from new and literally still as brand spanking new car. 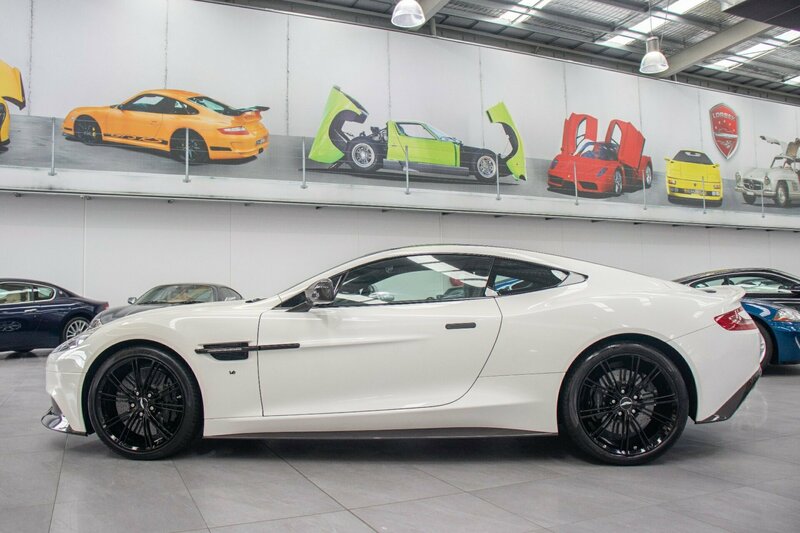 This was an outrageously super expensive purchase when new and now less than half of new car cost price. 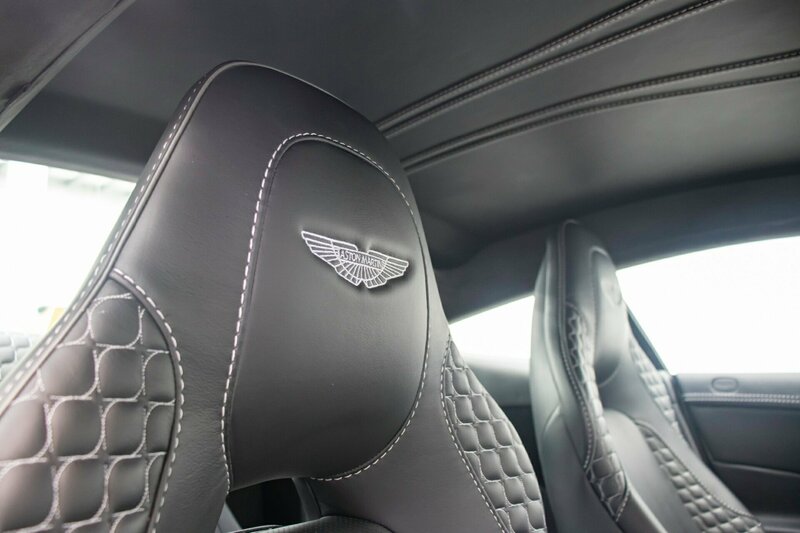 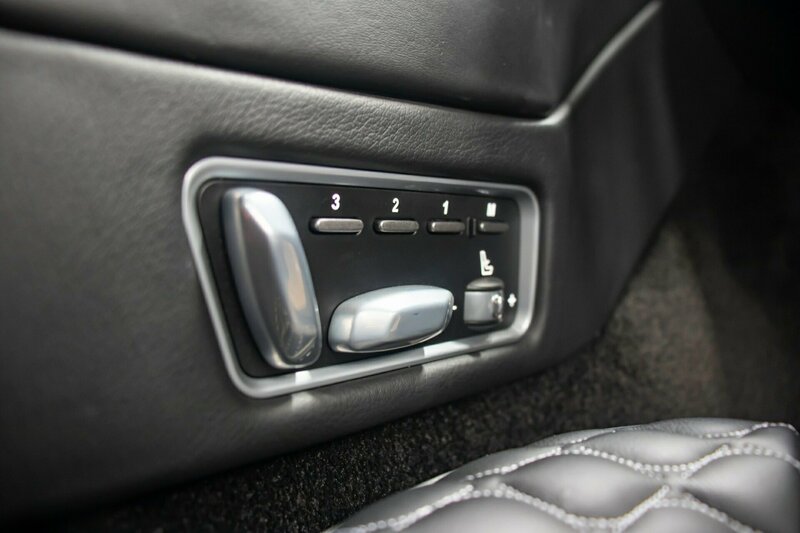 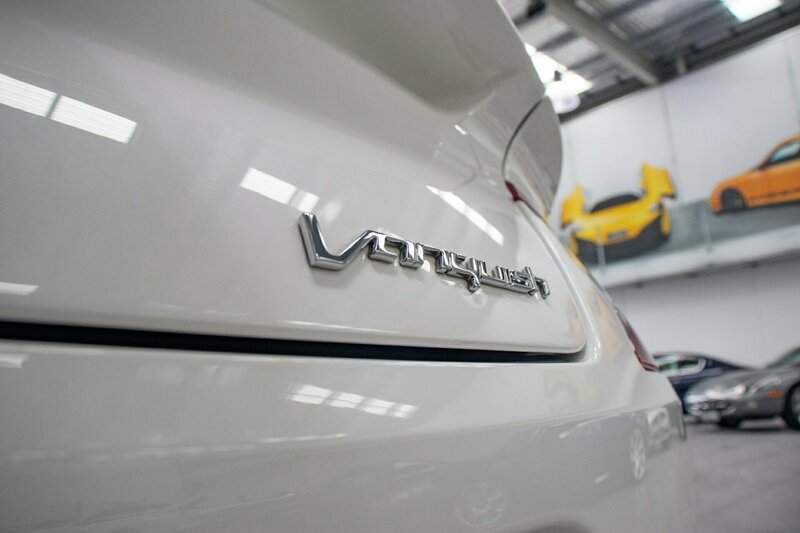 Suit astute as new car condition buyer wanting to save a FORTUNE. 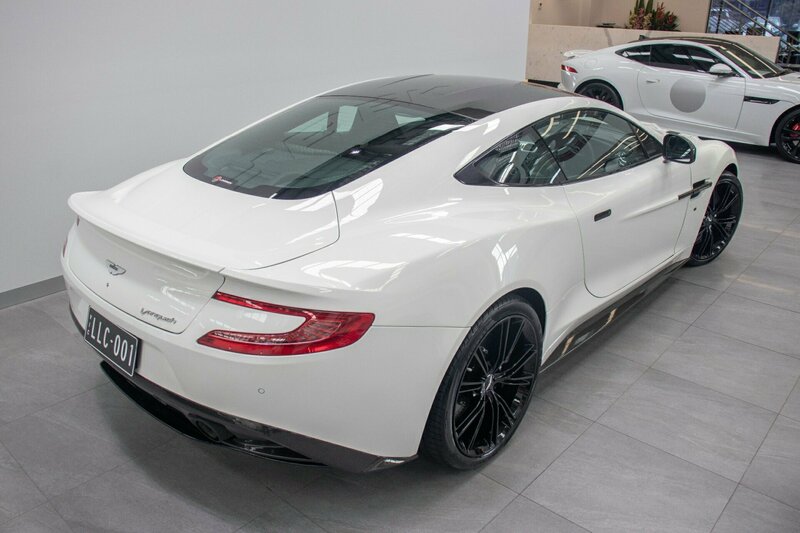 Future collectible classic exotic for ONLY $269,990.